You know what they say; dynamite comes in small packages. While the heat of Barrett’s Ridge Chilli & Garlic beer bread definitely isn’t topping out the Scoville scale, there is a definite warmth that permeates through every loaf. If explosive taste is what you’re after, we definitely recommend adding a few packets to your pantry. Top your Barrett’s Ridge Garlic & Chilli beer bread with onion jam. Slathered in savoury and sweet, one slice simply won’t be enough. Wheat, Flours, Sugar, Baking Powder & Salt, Cheese Powder, Herbs and Spices. Pour entire contents of Barrett’s Ridge Chilli & Garlic into a bowl. Add 1 x 330 ml beer at room temperature. Stir until the batter is thoroughly mixed through. Scrape batter into buttered loaf tin. For an extra crispy crust, brush your loaf with melted butter before baking. *Baking times may vary, so keep an eye on your oven. Lamb potjie. It’s only fitting that this fiery little number is best paired with a dish that has spent a few hours on glowing red coals. 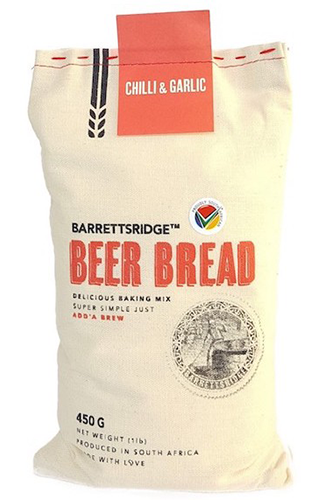 But unlike the potjie, your Barrett’s Ridge loaf is ready in only 45 minutes with much, much less fiddling and faffing. What’s your serving suggestion? Share it with us on the Barrett’s Ridge Facebook page! The Barrett’s Ridge bread bakers recommend pairing our Garlic & Chilli mix with a cider of your choice. Bubbles, sugar and tannins so soft and intense, producing a sweet golden liquid that tames the chilli perfectly. Peppadews will add the perfect little pop to your next garlic and chilli bread.